Parks’ 6 Tots Gift Sets make lovely gifts for friends and colleagues, but are well suited to being deployed as a deserved present to yourself. Every set consists of a set of six identical ‘tot’ size glass votive mini vases, filled by hand with some of our finest aromatherapy grade scented candles, and then packed into a lovely presentation-quality gift box. Each ‘tot’ will burn for a full eight hours of continuous use, or more than a week if used for an hour or so each day. They are very richly scented, and can quickly improve the atmosphere of a home or other space. When you first open a Parks Orange, Cedarwood and Clove 6 Tots Gift set, the first scent you notice is pure, clear clove essential oil. This is the scent of the holidays to many, reinforced with orange essential oil to be reminiscent of fine pomanders and even finer desserts. These scents are reinforced with the mellow, subtle, yet persistent scent of 100% natural cedarwood essence. Precious woods like cedar are prized for their earthy, well-rounded notes which, in this case, act as a bridge for the clove and orange oils, giving them a depth and gravity that they could never achieve on their own. 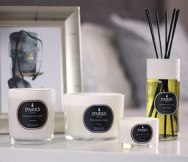 These scents are combined in a mix of natural, pure waxes, and set around a smoke-free cotton wick which work together to give an even, soot-free and steady flame from their first moment to their last.